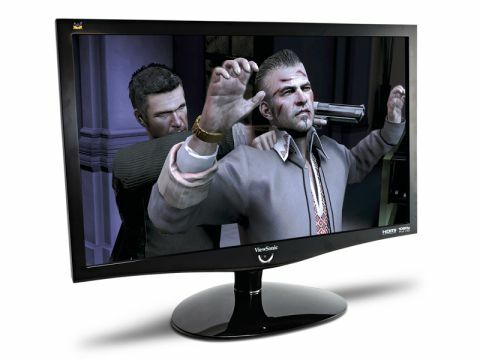 Here we have the Viewsonic VX2739WM, a 27-inch monitor to claim the crown of 'World's First 1ms Monitor'. But can you have too much of a good thing? When it comes to LCD monitor pixel response, that's a definite affirmative. For starters, monitor manufacturers have been known to do some unspeakable things in order to achieve ultra-low claimed pixel response times. More to the point, the fastest panel type currently available is twisted nematic, or TN for short. It also happens to be the ugliest in terms of pretty much every other metric of image quality. Lump it altogether and you have plenty of reasons to be sceptical about any new screen claiming to deliver eye-catching response times. You might assume the shiny new Viewsonic VX2739wm, the world's first 1ms monitor, is guilty of all charges above. In many ways it is. But it's also a pretty good panel for the price. Let's get the bad news out of the way first. This is a TN panel to which Viewsonic has applied the usual technological kludges in order to achieve quick response times. We speak here of overdrive, a technique that pumps pixels full of excess voltage in order to make them change colour more rapidly. To a point it works. But it can also cause some nasty image artefacts. Often referred to as inverse ghosting, the problem involves a trail or shadow that appears in the wake of a moving object in approximately the opposite colour to that object – hence 'inverse'. Unfortunately, the VX2739wm has it and it has it bad. All sorts of weird and not very wonderful things can be seen whether you're in-game or just shuffling a few windows around the desktop. Fugly stuff. The good news, however, is that this isn't your only option. Viewsonic has made the VX2739wm's overdrive completely switchable. In fact, three levels of pixel response are on offer and it's only the fastest that suffers from overdrive-related nastiness. Of course, it's also only the fastest that hits the 1ms metric. But no matter. The middle setting still makes for an extremely responsive screen and one that doesn't suffer from obvious image quality flaws. Elsewhere, this monitor mostly impresses. The 27-inch diagonal and full 1080p native resolution works extremely well, offering decent elbow room and good font legibility along with stacks of in-game detail. As TN panels go, colour saturation and vividness are also strong, even if TN weaknesses, such as narrow viewing angles and colour compression are sometimes all too apparent. It looks pretty slick, too. Okay, the tilt-only stand is hardly the last word in finely engineered adjustability. But thanks to the glossy black plastics, restrained styling and solid build, it adds a sophisticated dash to any desk. It wouldn't look out of place in the living room, either. All of which means we're very happy to recommend Viewsonic's latest. For under £300, it's a very nice image-rendering device. Just don't get too excited by all that 1ms malarkey. It's basically a load of rubbish.